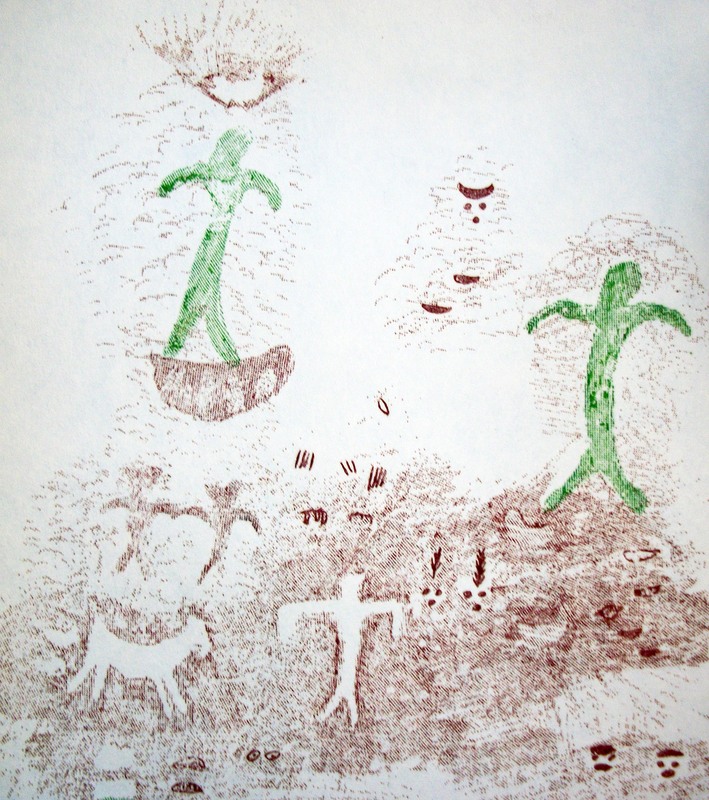 Reproduction of Middle Terrace Pictographs from Falls Creek Cave (Ignacio 7-2A). Adapted from Daniels (1940). One of the lesser known programs that funded archaeological excavations during the Great Depression was the National Youth Administration (NYA). NYA archaeology has been overshadowed by projects funded by its more prominent “cousin,” the Civilian Conservation Corps (CCC), and its older “sibling” the Works Progress Administration (WPA). NYA was targeted to younger Americans, aged 16 to 24, because young workers were especially hard-hit by the Great Depression. The larger WPA favored men with families, which was not the case for most of the young. The young also were less likely to have much work experience, and thus were less attractive to employers. The CCC was also targeted to the youths of America, but only allowed men to participate, required those men to live in camps that were usually far from home, and had a poor record with participation by non-whites. The NYA was specifically formed, initially as part of the WPA, to address these issues, and gave young men and women the chance to work while staying at home—often making it possible for them to stay in or return to school. The young men and women that worked on the Durango Public Library Museum Project began their NYA work clearing and preparing a room in the library to serve as a museum of regional American Indian culture, both contemporary and that preserved in the archaeological record. “Labor for excavating the site [Ignacio 12:23] was secured through the co-operation of the Works Progress Administration, and the National Youth Administration. Boys between the ages of sixteen and twenty-five whose families have been on relief, who are unemployed, and not attending school are eligible. They are paid thirty-seven cents an hour from these funds and are allowed forty-four hours time each month” (Daniels 1940). “Had we ten boys assigned to us constantly we might have saved some of the material which was destroyed at Animas city as trenches were dug through mounds during the construction of the WPA Sewer Project or as they leveled the playground east of the PWA building of the new Emory Smiley Junior High School where the steam shovel leveled and destroyed another ruin. Archaeology is an expensive occupation for they usually seek out of the way places with expensive transportation and difficult problems while doing the work. Here we see sites destroyed daily by our attempts to make a modern city. We could not stop the gravel pit, the highway crews, or the CCC Camps occupancy of prehistoric sites, and we salvaged what we could with the facilities at hand, compiling a generous record of the house forms, skeletal material and tools of early residents of the San Juan Basin. With the newly discovered and constantly refined methods of wood reading [e.g. dendrochronology] we have more material that is definitely dated within this area than can be found in any comparative area of the southwestern United States. Our responsibility remains now to develop in a scientific manner what remains before it also is destroyed in modern progress” (Daniels 1940). Daniels actively worked with professionals on her project, consulting with them as she could. She and her technical advisor, I. F. Flora, made a particular effort to recover material suitable for the then relatively new technique of dendrochronology (e.g. “tree-ring dating”). Samples recovered by the NYA workers extended the local tree ring chronology back to 253 A.D. Although her writings are a bit challenging to follow at times, and assumes a bit of knowledge upon the reader, I plan to highlight more of Helen Sloan Daniel’s work with NYA archaeology in the Durango area at a future date. My greatest thanks go out to Donna Arment, Technical Services Librarian at the Durango Public Library, who quickly sent me a copy of Daniels (1940) shortly after I inquired about it. Daniels, Helen Sloan (1940) Durango Public Library Museum Project of the Archaeology Department. Compiled by Helen Sloan Daniels. Drawings by James G. Allen. Drawings and Stencils by Mary Marquez and Pearl Oliver. Typing by Mary Nestora Sena. Durango Public Library Museum Project, National Youth Administration, Durango, Colorado. I am working on a grant that the Animas Museum in Durango, Colorado applied for to work with the Helen Sloan Daniels collection that they have on hand. I see that your primary source of material for the Helen Sloan Daniels article was from her 1940 publication. If you have or run across any additional documentation about the NYA excavations or where in particular I might be able to track down some of the photographs and documents sent to the NYA administration office in Denver, CO, I would greatly appreciate this. I will be working closely with the CSWS at Fort Lewis to search through their holdings as well. hello, this is Mona Charles. I am looking to see if you can send me the digital copy of the 1940 Durango Library Museum project? I have a hard copy but would like a digital copy in pdf format if that is what you have. Otherwise, I will be digitizing our copy which could take us quite a while. It will be very good to have a digital copy to work with. Hello again Bernard. I as wondering if you found a digital copy of the Helen Sloan Daniels 1940 Durango Library Museum project? Also, can you point me in the direction of finding archives from the NYA projects in Colorado? Specifically I would like to see if I can track down photographs and bulletins that might shed some more light on the Durango Public Library project.